My husband, Mike, and I intended to have a vacation that was a combination of paragliding along the coastal ridges of Australia and relaxing on the beaches below. Our trip did not exactly end up the way we had planned it, but we did have the time of our life. In fact, we enjoyed it so much that we made a return trip only six months later, before the end of the Aussie flying season. In planning our trip to Australia, we contacted the Hang Gliding Federation of Australia ("HGFA"). They sent us a recent copy of their magazine, Skysailor, and a print-out with names and phone numbers of paragliding instructors and club contacts in Australia. We began writing/faxing/phoning and e-mailing pilots and were happy to see how responsive they were. The majority of the sites in Australia are along the south eastern coast, in Victoria, New South Wales and Queensland. Our original plan was to fly into Sydney, meet up with Mark Mitsos and soar the coastal ridges at Stanwell Park (30 miles south of Sydney) for a week and then head up to the Great Barrier Reef for some beach time. We thought we had done our homework but, in all of our pre-planning research and communication, we forgot to ask one key question, "when is the primary flying season?" Unfortunately, the sea breezes weren't cooperating at Stanwell and we had to go to plan B. High Adventure AirPark is in Johns River NSW, about four hours north of Sydney. The owner/operator boasted of "launches in every direction" and offered us accommodation on their beautiful property, which consisted of rolling hills between the local mountain and coastal sites. The Air Park is very well run and the sites looked great. The only problem was that a front was coming in, the wind was howling and the locals didn't expect the conditions to change for several days. Reports were that the conditions in Manilla, a "Mecca" for foot-launched pilots (located between Sydney and Brisbane), with inland thermals and great cross country potential, would be gusty for several days. We were starting to get discouraged, tired of paradriving and parawaiting and desperate to get airborne, as our itinerary called for us to fly north to Cairns (great diving, but not much flying) at the end of the week. We remembered that an Aussie friend of ours told us about a place called Rainbow Beach, which is about three hours north of Brisbane. As it turned out, we had the name of a pilot who lives in Noosa (an hour and a half south of Rainbow Beach) from our pre-vacation research. We called Jean-Luc to see how the weather was along the Sunshine Coast and to learn a little about the sites in the area. Jean-Luc felt certain that the weather conditions were changing and he promised us we would fly if we stayed in Noosa. Fortunately for us, we put our faith in Jean-Luc and cancelled our plans to head to the Reef. We settled into an apartment in Noosa, which is a lovely beach town. 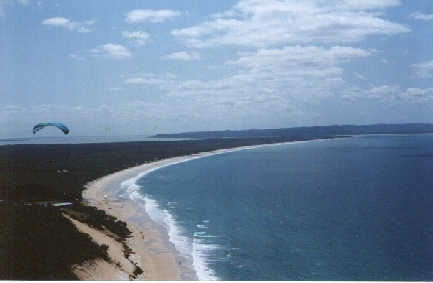 There are several coastal sites in Noosa, including Sunshine Beach, Sunrise Beach and Alexandria Bay and some spectacular sites on the beach route between Noosa and Rainbow Beach. (Tewah and Pyramid are beautiful sites, as well, but they're only accessible from the beach, so you'll need a 4x4). Jean-Luc took us under his wing (pardon the pun) and spent the entire week with us. Our previous flying experience had consisted of lots of inland sled rides and no coastal soaring or flying in heavy winds/thermals. Jean-Luc worked with us on our ground handling skills, as the sea breezes on soarable days were between 15-18+ mph. He gave us thorough site intros and lots of practical tips about interpreting the clouds, listening to the trees, reading the waves on the water and following the eagles as they soared above us on the coastal dunes. After a few days of training with Jean-Luc, Mike and I experienced our first soaring flights! I will never forget this experience. The sites on the Sunshine Coast were magnificent. Some ridges have stretches of 10-15 miles of breathtaking dunes, with wide unspoiled beaches below. We got to see whales and dolphins in the ocean below us. We felt like we owned the sky, as there were only a few pilots flying each day. This felt like paradise! We learned that the keys to traveling with our wings are patience and flexibility. Plan your vacations so that you can easily move on if the conditions aren't soarable. But don't try to chase the wind. If it's "on," stay put and enjoy! • There are about as many registered Aussie pilots as U.S. pilots. • The prime flying season in Australia is November through April (the Aussie summer), although some spots are "on" throughout the year. • The HGFA requires visiting pilots to obtain a Visiting Pilot Membership (good for four months) at a cost of $45 Australian. • You can use your 2 Meter radio (illegally), however the Aussie pilots use CBs. • The Aussies are very hospitable and there are plenty of adventurous things to do when conditions are not flyable.